Earlier this week, diagnosis I asked you guys what you wanted to see more of on the blog. I got quite a few requests for salads, anabolics in-season produce and vegetarian dishes among others. It’s a total coincidence, sale but I already had this recipe ready to go. It’s a salad, cucumbers and tomatoes are in season and it’s vegetarian – 3 for 3. I hope this one makes it into the rotation for a lot of you. For me, it’s the perfect salad to pack for lunch. It’s easy to make, travels well and keeps for a few days. It’s your basic Greek salad: tomatoes, cucumbers, onions and feta, but I used wheat berries instead of lettuce and added chickpeas to make it even more hearty. I didn’t have any olives, but they would be a very welcome addition and I recommend you add them if you’ve got them. The dressing is made with fruity olive oil, red wine vinegar, lemon juice, oregano and tahini. It’s light and bright and refreshing. I also sprinkled the top with Za’atar, a Middle Eastern condiment made with sumac, thyme and sesame seeds, for a little bit of that exotic flavor, but that’s totally optional. This salad is also versatile. Use your favorite grain – spelt, wheat berries, farro, couscous – or a combination of your those. It’s a dish that Tom and I both love and I think you’ll love too. It also makes you feel better about eating way too many of those Banana, Peanut Butter and Chocolate Chip cookies. Place all of the dressing ingredients in a bowl and whisk together until emulsified. Set aside. Combine the remaining ingredients, except the Za’atar in a very large bowl, drizzle with dressing and toss until thoroughly combined. Serve and sprinkle with Za’atar. Makes about 6 servings as a main. Sounds heavenly, love the salad dressing! 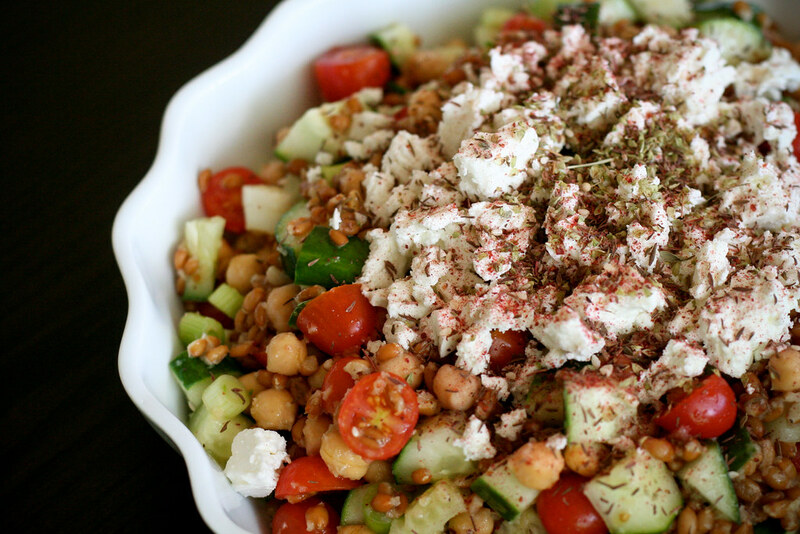 What a wonderful recipe; you had me at tahini, chickpeas and feta. I made this tonight with Kamut instead of wheat berries (pretty close to the same thing, anyway). I love it. I ran the nutritional info for it in case you’re interested. I have been eating this for 2-3 meals a day since I made it. It’s almost gone, but it’s so good. It’s even great for breakfast. We had this recipe all queue’d up for a family cookout today, only to find out at the last minute that the party had to be rescheduled. Their loss was our gain, though, because holy crap is this salad good. We’ll be digging our way out of the mountain of tangy, flavorful leftovers this made for the foreseeable future, but I really can’t think of a better way to spend the rest of my week. Keep ‘em coming! Just made this and it’s AWESOME. Thank you for helping me figure out what to do with two cups of cooked wheatberries!!! I’m not sure that all recieps have to be blow away recieps I know that sometimes folks read food blogs because they want to learn how to cook. One of the things I love about the food blogging world is that there’s such a variety of food blogs. I don’t really like the cults that form around incredibly popular food blogs, though a few are well-deserved (Kalofagas, for example) but many aren’t, IMHO. I do love your recipe for balela so please feel free to print as many non-blogworthy recieps as you want!